The Bay of Islands is known for it’s lush greenery and towering forests. But kauri dieback is threatening our giant kauris with imminent extinction. Without your prompt action, our Northland regional parklands may vanish completely. For 30 years, this disease has existed for some time on Great Barrier island off the coast of Auckland. However, its recent spread to the mainland is directly threatening areas as far east as the Coromandel. In fact, a recent study from the Auckland Council shows that of the distinct areas of kauri forest within the Waitakere Ranges Regional Park alone (which are above 5ha in size) 58.3% are exhibiting symptoms of kauri dieback infection within them to some degree. 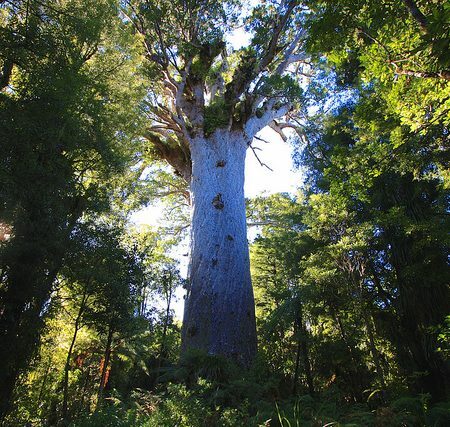 Sadly, there is no known treatment or cure for Kauri dieback disease. But there are steps you can take while exploring our region to stop the spread of this infection. Before we jump into prevention measures, let’s take a look at what Kauri Dieback actually is. There is no cure for this infection and the disease kills the majority, if not all, of the kauri it infects. This nasty pathogen can lay dormant in soil for many years, even when there are no kauri trees within reach. What’s worse, is that It only takes a pinhead of soil to spread this infection. What causes it to spread? This microscopic fungus-like organism infects kauri of all ages, from seedling to fully-grown mature trees. We now know it spreads from the roots to the remainder of the tree. But how does it spread to previously uninfected areas? Unfortunately for visitors to the region, you are the highest risk vector for its movement. Soil disturbance associated with human activity such as walking on forest tracks and cutting through the bush on unmarked paths is the main way this infection is spread to new areas. In layman’s terms; the dirt you carry on your boots from walking track to walking track is Kauri Dieback’s biggest help to move around. While there are some giveaways that a tree is terminally infected, such as yellow leaves, dead branches, a thinning canopy or bleeding gum at the base of the tree, many infected trees will show no visible signs of infection. So, just because a tree seems healthy, you can’t be sure that it is. For this reason specific steps must be taken to avoid spreading this disease further. What is being done about this infestation? Concentrated preventative action is ongoing throughout the Coromandel and Northland areas. These initiatives even saw the closure of several Bay of Islands walking tracks in 2016 to prevent further spread. However, visitors to these areas are also their greatest threat. Here’s what you can do to help. 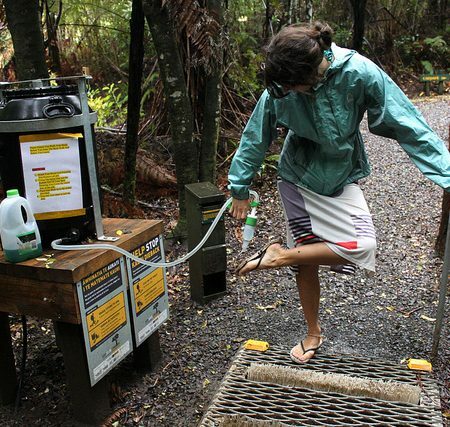 To halt this infestation, It is vital that all of your footwear and other gear is cleaned and disinfected before going near kauri and again before leaving an area with kauri. This is regardless of how long your gear has been in storage.